Available now on special offer: get your first 12 months for only $140,04 instead of $199.99. Starting the 13th month, pay only $199.99/12 months. Available now on special offer: get your first 3 months for only $41.97 instead of $59.97. Starting the 4th month, pay only $59.97/3 months. VEGAS Pro 16 once again stands out as an innovative leader when it comes to non-linear editing. The modern user interface delivers a completely customizable experience that provides the ultimate in flexibility. Designed to directly support your preferred workflow, these UI innovations enhance the fast, organic timeline-editing workflow that VEGAS Pro invented. With full support for High Dynamic Range (HDR) color now included with VEGAS Pro 16, you can work with video footage from the latest cameras, preview your work on an HDR reference monitor and deliver stunning-quality HDR work. Turn shaky footage into smooth, pro quality video. The video stabalization engine has been rebuilt on our own from the ground up with state-of-the-art technology, resulting in a feature that is easy to use and one that gets you smooth results every time. Sophisticated masking and motion tracking tools let you follow moving objects precisely. You can then easily "pin" text and video to them. You can also apply color grading, special effects, and other video filters that follow tracked objects as they move through the scene. VEGAS Pro 16 includes 360º templates for some of the most popular cameras. Set your project up as a 360 project, stitch dual fisheye files seamlessly, preview your file with complete 360 control, apply 360 filters, and deliver as complete 360 videos. Give your viewers a completely immersive experience with 360 video. As more and more elements of VEGAS Pro become compatible with High DPI monitors, you can change to High DPI mode to take advantage of an even crisper, clearer user interface on your High DPI monitor. Speech from a video that has been transcribed and entered as named regions in your project, a text file, or a spreadsheet can be used to instantly create a subtitle track. Subtitle positions can be automatically synced to project audio events and can be edited for fine tuning. Sometimes your project contains either the video or audio portion of a video clip on the timeline and you decide that you want the other portion too. This feature instantly finds the missing portion, creates an event for it and syncronizes it to the existing portion. Edit multicamera productions intuitively and efficiently with VEGAS Pro. Switch between a virtually unlimited number of video sources with a keyboard command or a click of your mouse. Easily transform a multicam track into an individual event for detailed editing. Apply velocity envelopes from 100% reverse speed up to 1,000% (10x-speed) forward speed. CTRL+drag an event edge to stretch or compress playback. Match colors between clips in the highly versatile and powerful L*a*b* color space. Select a preset or use control elements to easily select an image for custom optimization. Use the the ACES 1.0 Academy Color Encoding System to take advantage of the modern color science and expanded color spaces of modern video cameras. Add a video effect or filter like Pixelate, then apply a mask to limit the effect to a specific portion of the video to obscure logos, license plates or faces without affecting the rest of the video. Utilize the integrated tools for basic 3D adjustments to enhance your project and ensure professional 3D results. Typical corrections include horizontal and vertical offsets, zoom discrepancies, keystone and rotation. VEGAS Pro uses a multi-layer, top-down paradigm for compositing and masking, which enables you to assign tracks as parent or child tracks. Apply compositor effects to create stylized lighting and textured looks. An impressive array of compositing modes provides comprehensive options for visual design. The 3D Source Alpha mode enables you to move and rotate tracks in 3D space and use them in a stereoscopic 3D project. The LUT OFX plug-in enables you to apply both camera and stylistic LUTs to easily and quickly apply the exact look you're after for your video footage. Fast, smooth time-line editing. Quickly overlap timeline clip events to instantly create a crossfade between them. VEGAS Pro 16 supports media in up to 4K resolution. Working in high resolution offers more details and flexibility, which makes it ideal for compositing and video effect work. VEGAS Pro natively supports XAVC, XAVC S, HEVC and AVC files as well as RED ONE® and RED EPIC® files. Take advantage of hardware acceleration from modern NVIDIA and AMD graphics cards and Intel's emerging QSV (Quick Sync Video) technologies to enhance real-time performance and shorten rendering times for certain formats. Natively edit formats such as HEVC, XAVC, and XAVC S in HD, 2K and 4K without additional add-ons or plug-ins. Create Smart Proxy clips in VEGAS Pro 16 and enjoy faster playback of high-resolution video footage. Depending on playback settings, media will automatically and dynamically switch to proxy. The original data is maintained for the final post-rendering version. You can also set a preference to automatically create proxy files when you add Ultra HD media to your project. Organize your completed project along with its associated media with the flexible Archive feature. You can also archive all media associated with a project or only the media used on the timeline, including nested projects. The Open Effects Association platform is a contemporary technology that provides video effect plug-ins from third-party developers. The resulting steady stream of innovative plug-ins gives VEGAS Pro users a wide range of special effects and fresh techniques for creating cutting-edge productions. Real-time controls on the Video Preview window enable you to achieve precise placement, sizing and movement of the picture overlay and see the results immediately. Quickly create inset images for a picture-in-picture composite or zoom way into your video and then pan across it to show different areas. Get instant real-time feedback as you crop still photos or video frames with controls directly on the Video Preview window. Apply a camera or special-effect LUT to your media file, a single event, a track, or the entire project to achieve special color-grading effects and custom looks. VEGAS Pro supports the OpenFX standard. Work with high performance plug-ins from many manufacturers to add filters and effects directly within the program. Place the cursor within a timeline clip event and create a frame-accurate freeze frame with one click. The new OFX plug-in for stabilizing 360° videos allows you to save shaky 360° shots with just a few clicks. It is perfectly integrated into the 360° editing workflow, allowing you to quickly achieve the desired result. 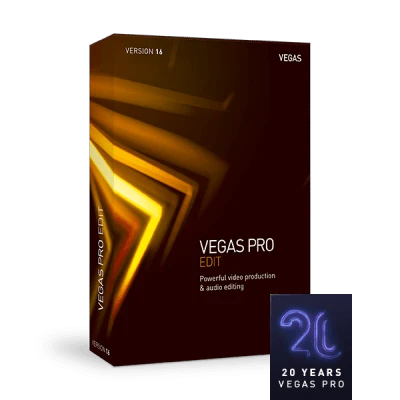 VEGAS Pro includes powerful audio recording and editing tools for the most demanding productions. Record audio in a multitrack environment with input buses, professional metering, punch-in recording, unlimited tracks and more. Automate your audio mixes with real-time envelope automation recording, join audio recordings with a variety of automatic crossfade types and create mixes with assignable effects. No other NLE provides a digital audio workstation feature set as robust as the tools in VEGAS Pro. Create 5.1 surround mixes directly within VEGAS Pro 16. Use the panner to automate tracks and buses and produce breathtaking soundtracks for DVDs and Blu-ray Discs. Apply surround effects to track level or directly to the sum. This way you can exercise full control over your mix. To finish, export your project for encoding into Surround format. In addition, VEGAS DVD Architect software imports AC-3 files for multichannel 5.1 DVD and Blu-ray Disc creation. VEGAS Pro supports standard VST interfaces. Apply effects to individual objects, events on a track and buses. Choose from more than 40 included signal and effects processing tools and automate effects with envelope control in real time, including the brand new MAGIX eFX professional audio plug-in collection. Wave Hammer Compression, EQ, and noise gate as well as reverb, chorus and delay are all included. Surround effects for the master bus include EQ, dither and Wave Hammer Surround compression tools. VEGAS Pro 16 supports BWF for easy exchange between audio editors and broadcasting platforms. Record, monitor, and mix audio from external devices via input buses to take advantage of your hardware compressors, reverb units, echo boxes, and other outboard equipment. Use the real-time rendering option to mix audio from external audio devices into your final render. Optimize your mixes to maximize audio dynamic range. Create compliant renders for any signal path. This helps you achieve the perfect auditory experience for viewers. Record track envelope and keyframe parameters in real time with a mouse or external control surface hardware. Choose between touch and latch record modes and utilize automatic post-record keyframe thinning. Automation parameter control is available for both stereo and surround tracks and buses, as well as for video tracks. The dynamic storyboard workflow might just change the way you edit from now on. Quickly assemble rough cuts and alternate versions in an uncomplicated storyboard environment. Changes made to the main storyboard are reflected instantaneously in the timeline. In reverse, edits on the timeline can be synchronized to the storyboard with only one click, or automatically. Additional storyboards can also be created and used for experimental edits, alternate sequencing, or to keep track of different sections within your video. Hover scrubbing project media thumbnails gives you a quick way to identify the important points in your video files before you add them to your timeline. Simply move the mouse over a thumbnail in the Project Media window and scrub through the video to find a specific frame. With the ability to place the hover scrub cursor at an exact frame within the Project Media thumbnail, you can now create an In or Out point at that location. When the file is added to the project, the resulting event will then automatically be trimmed down to these defined in/out points. You can set In and Out points for any type of media in your project. Project media thumbnails can now be enlarged so you can see more detail and achieve finer hover scrub motion. You now see a more accurate location of specific video frames and can edit with much finer hover scrubbing and more accurate in/out marking. It's now possible to select more than one media file in the Project Media window and preview each file, one after the other, in one continuous operation. This is great when you are working with storyboards because you will quickly be able to preview the entire storyboard in sequence. Now you can now drag media bins (which include storyboard bins) with different media files within them directly to the project timeline. This adds all of the media files simultaneously, saving time because files need not be added one by one. VEGAS Pro 16 has a comprehensive list of file backup options. You can back up your work after a set time (determined in minutes, hours or days); save the current project after every edit, and also save a backup file (or number of backups) after every edit. All backups can be saved to the same folder as the project file, a temporary location or any user-specified location. Now you can easily and automatically close the gaps between any events on a selected track within a project. This helps you quickly clean up your projects and ensures you have no black frames between edits. You can now select events from the current cursor position, including all events on selected tracks or within the entire project from the cursor to the end. It's a great way to quickly create space within a project to insert other events. This innovative menu system enables you to customize high-traffic areas of the user interface so you can find the tools you need quickly while at the same time keeping the workspace clutter free. Choose the background shading that works best with your studio lighting and adjust the color strength of button icons depending upon how much you use color for identifying your tools. Use modern, logical docking controls to adjust your window layout so that it perfectly fits your unique workflow. Easily save and recall layouts designed for specific production tasks. VEGAS Pro supports import and export of external project files. Transfer between and convert system-compatible and external file formats. Finalize projects in VEGAS Pro that were started in Avid, Final Cut, DaVinci, or Adobe Premiere and After Effects. With the powerful, flexible Bézier Masking plug-in, you can create up to five different masks, choosing from oval, rectangle or custom shapes. These can then either cut a section of the video out to reveal different video beneath, or have an effect applied within them – such as color grading or blur – making it possible to blur someone's face while leaving the rest of the video in focus. Tied in with the new motion tracker the mask can move along with an object during the course of the video. Tiny Planet videos have grown in popularity and quickly captured people's imagination by allowing you to create an effect where a subject appears to be standing on a super-small planet. The VEGAS Pro Tiny Planet OFX plug-in is the easiest and most elegant solution to create this popular effect and includes effect animation and integration with regular or 360º videos. VEGAS Pro 16 includes MAGIX's renowned high-quality Essential eFX audio plug-in suite: a great-sounding and very flexible set of tools for shaping and mastering audio. It includes plug-ins for improving the quality of the speech and music in your soundtrack, reducing any noisy elements or adding quality special effects like delay, reverb and chorus. Add spectacular lighting effects to your films. This plug-in from the leading developer BorisFX allows you to recreate the kinds of incredible lighting effects used in many recent blockbuster films, so you can add another level of excitement to your video creations. Create everything from more subtle light leak and cloud effects to dramatic 3D lens flare and sci-fi laser effects. Enjoy 100 effects from proDaD VitaScene LE A high quality plug-in featuring many keyframeable effects and transitions. These include light and mood filters and paint effects to turn your films into a high-contrast 'watercolor' paintings or drawings. There are also restorative plug-ins to help you salvage old or corrupt video and more creative tools such as the popular tilt-shift 'mini city' effect. VEGAS DVD Architect allows you to create DVD and Blu-ray discs with professional authoring functions. The intuitive drag & drop interface, compact layout and comprehensive authoring tools make producing menu-based Blu-ray and DVD projects easy. The full version of proDAD's incredible suite includes around 700 effects ready to use for a huge number of purposes: from restoring video to spectacular visuals. You get light and mood filters, paint effects and incredible movie effects, light rays, glows, glimmers and glitters. All are available as transition effects and video filters for your video material, texts and graphics. Ignite Pro: 180 plug-ins, 550 effects! Ignite Pro includes 180 plug-ins to help you create just about every video effect imaginable, from colour correction and video clean-up to special effect generation (lasers, clouds and so on), grunge effects and spectacular warp-style effects. It is the hassle-free solution to creating incredible professional effects. 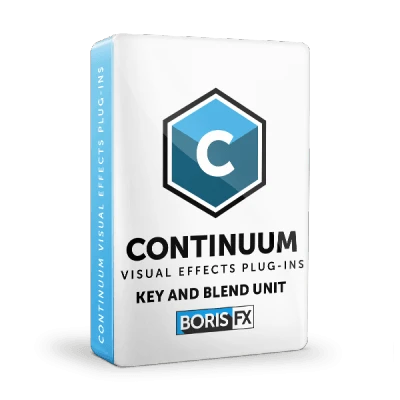 A suite of pro effects from Boris FX will take your video productions to other worlds and dimensions, with spectacular natural and synthetic lighting effects. Create everything from the 3D lens flare used in Hollywood movies to more subtle glows, glints and glares. Sapphire 11 also includes integrated Mocha tracking and masking, professional keying, and particle effects to help add another level of sparkle to your creations. With its drag-and-drop workflow, DVD Architect, included with VEGAS Pro, makes it easy to author professional-quality DVD or Blu-ray discs. Drag your media onto the workspace to automatically create custom navigation for feature videos, director’s notes, sound track music and more. Create custom keyframe-compatible graphic animation and overlays by importing multi-layer Photoshop files. A simple settings re-set enables you to burn an SD DVD and then switch and burn a HD Blu-ray disc.